For this post I wanted to share some different, cute, and easy ideas that anyone can do for Valentine's Day. On top of the cream puffs, I made cupcakes, cake balls (well, cake hearts), and cookies. I gave a bunch of these desserts to the girls that I work with, but I wanted to jazz them up a bit and give them a real Valentine twist! It was extremely easy to do and these treats are especially cute if you have a child in school that may be having a Valentine's Day party. Can you see the written message in one of these photos?? 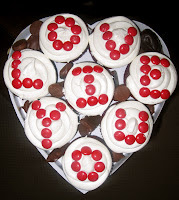 -Valentine's Day candies such as M&M's, conversation hearts, kisses, etc. First, dump out all of the candies that come in the heart boxes and set aside. Frost your cupcakes and place them in the boxes. If you squeeze them in just enough, you will be able to fit 8 (you can follow my set up from the photos above). Now, for the fun part.... Decorate the cupcakes any way you want! I usually use some of the reserved candies from the boxes, on top of kisses, conversation hearts, etc... Just have fun! Once the cupcakes are all decorated, use the rest of the reserved candies (I also use unwrapped Hershey kisses) to fill in the little gaps between the cupcakes. That way everything gets filled in and it still gives the appearance of being a box of chocolates. Cut the red velvet cake up into chunks and place in a large mixing bowl. Mash up the cake until it is all broken up and crumbly. Add the cream cheese frosting. It usually takes one batch of frosting per cake. Mix together until the cake begins to ball up and the frosting is mixed in well. Once you are done cutting out your hearts, melt the milk chocolate (or whichever kind of chocolate you are using) in a microwave safe bowl or a double boiler (the microwave method will just save time). Dip each heart into the melted chocolate until completely covered and return it to the parchment paper. Repeat this step until all of your cake hearts are covered in chocolate. Place the cake hearts in the fridge to let the chocolate harden and cool. Once the chocolate is hard, you can leave the cake hearts as they are, or melt a different colored chocolate to drizzle over the top. Remember, you can use any type of cake and frosting pair for cake balls, such chocolate cake with chocolate frosting, vanilla with vanilla, orange cake with vanilla, carrot with cream cheese, and so on - the list is endless! Rinse off strawberries thoroughly and pat dry. Make sure they are dry enough so that the chocolate will stick more easily. Set aside. Melt chocolate in a microwave safe bowl. Take each strawberry, one at a time, and dip into the chocolate. Once the strawberry has been dipped into the chocolate, place it on a piece of parchment paper. Repeat this process for the rest of the strawberries. 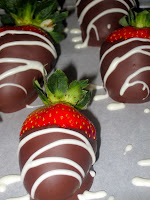 Once all the strawberries have been dipped, place in the fridge to allow the chocolate to harden and cool. 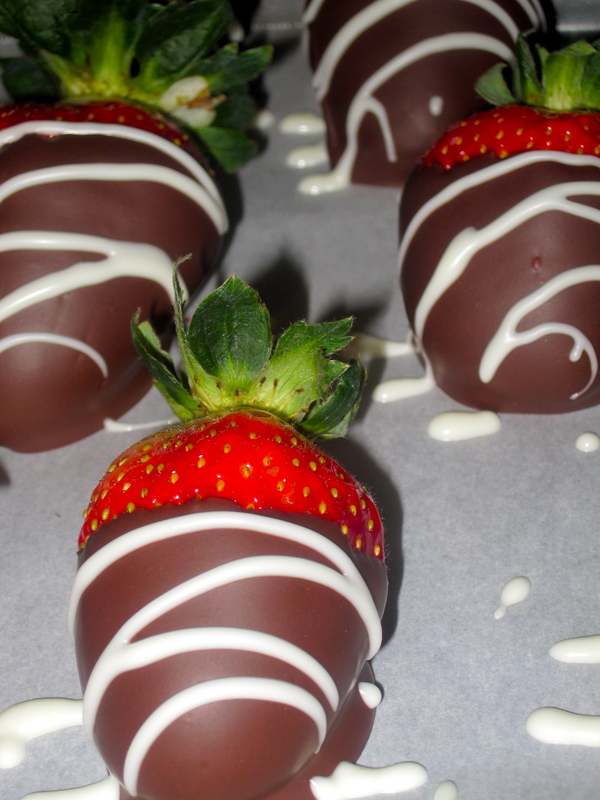 Once the chocolate is hard, remove the strawberries from the fridge and melt a different kind of chocolate (such as white chocolate) to drizzle over the top. To get more neat lines, you can pour the white chocolate into a bag, cut a tiny piece off of one of the corner, and squeeze the chocolate out that way. Allow to cool again, and enjoy! They all are so amazing..
Wow all these treats look delicious! Congrats on top 9! !1 Those are lovely and wonderful photos! Red velvet is one of my favorite cakes and I've never attempted cake balls. You've inspired me. Thanks for sharing the recipe and congrats on making the Top 9! Congrats on the top 9 on foodbuzz. I ventured into making some chocolates for the first time this year. What an adventure. 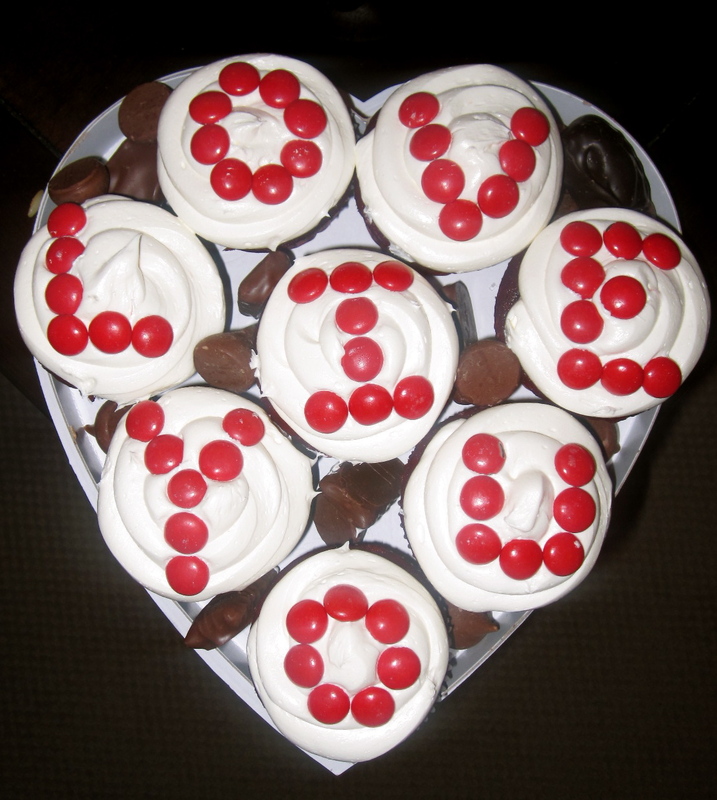 Your red velvet chocolate hearts look great. I soaked my RV cake in Kahlua before sealing it in a chocolate mold. 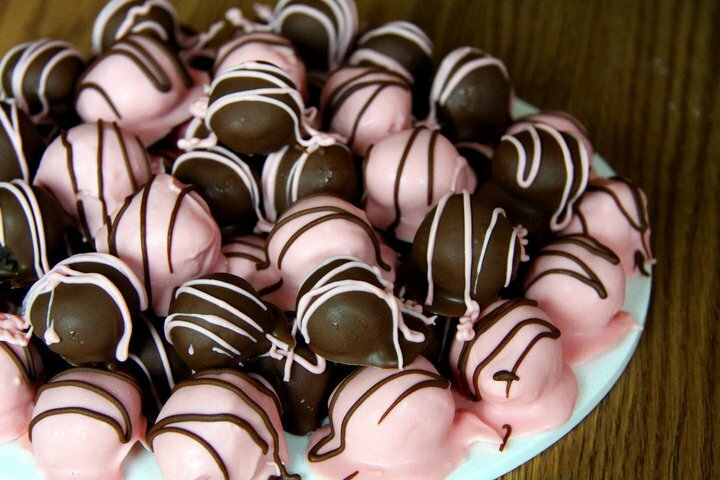 Did you use the wilton pink chocolate for dipping? If so, how did you thin it? It seems so simple, but using a cookie cutter to cut shapes out of cake is GENIUS! Thanks for sharing all of these delicious ideas! Wow, you have so many wonderful treats! You went all out, nicely done!! My husband got Chocolate Pudding with a heart on top... that's it!! Wow - These all look sublime! I bet you had a very happy Valentine's Day at your house! Hello - do you temper your chocolate ? I have tried making chocolate dipped strawberries and they seem to almost melt as soon as I take them out of the fridge. Yours don't look like that at all. Your chocolate-covered red velvet cakes are beautiful! And I love how simple they are. I honestly do not temper the chocolate in the professional sense. I melt my chocolate in a bowl in the microwave with 1-2 tablespoons of shortening. I used to use a double boiler, but a microwave is just easier! :) I stir it every 20-30 seconds to make sure the chips are completely melted. Once it's done, I usually only let it sit for a couple of minutes and then start dipping. Try using the shortening and let me know if you run into any more trouble. I have also heard of people using an edible wax that you can buy at the grocery store. Fantastic array of sweets!!! Each and every one is perfect! Wow! Those cute little ball, adorable. Pink and brown coloring are very chic too. Congratulation!